The pKLAC2 vector directs high-level expression of a recombinant protein from the yeast Kluyveromyces lactis and is compatible with the K. lactis Protein Expression Kit (NEB #E1000). pKLAC2 can be used for either intracellular or secreted protein expression. SacII or BstXI linearized pKLAC2 integrates into the LAC4 locus of the K. lactis genome upon transformation of K. lactis competent cells. The vector pKLAC2 directs high-level expression of a recombinant protein from the yeast Kluyveromyces lactis and is compatible with the K. lactis Protein Expression Kit (NEB #E1000). pKLAC2 can be used for either intracellular or secreted protein expression. SacII or BstXI linearized pKLAC2 integrates into the LAC4 locus of the K. lactis genome upon transformation of K. lactis competent cells. pKLAC2 differs from pKLAC1 (>NEB #N3740) in that it contains a universal multiple cloning site (MCS) that is compatible with all NEB expression systems. 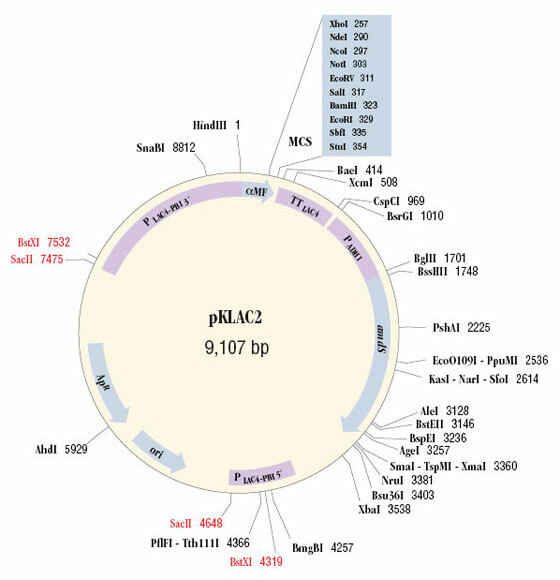 Vector pKLAC2 contains the strong K. lactis PLAC4-PBI promoter (1), DNA encoding the K. lactis α-mating factor (α-MF) secretion domain (for secreted expression), a universal multiple cloning site (MCS), the K. lactis LAC4 transcription terminator (TT), and a fungal acetamidase selectable marker gene (amdS) expressed from the yeast ADH1 promoter (PADH1). An E. coli replication origin (ori) and ampicillin resistance gene (ApR) are present for propagation of pKLAC2 in E. coli. The sequence of the pKLAC2 vector (GenBank #EU196354) and additional pKLAC2 information are available at DNA Sequences and Maps. Universal MCS lies downstream of α-MF secretion domain and PLAC4-PBI promoter. NEB5-alpha Competent E.coli (High Efficiency) (NEB #C2987), NEB 5-alpha Electrocompetent E. coli (NEB #C2989) and NEB 5-alpha Competent E. coli (Subcloning Efficiency) (NEB #C2988J) are all recommended for propagation and subcloning this vector. Colussi, P.A. and Taron, C.H. (2005). Appl. Environ. Microbiol.. 71, 7092-7098.